Hotel Krolewski has 0 votes. Click here to see the results. 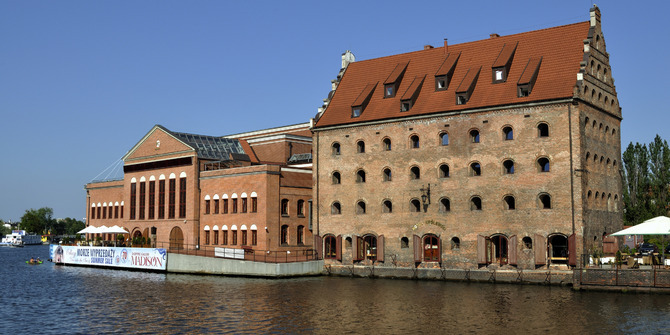 The brand new Krolewski Hotel (Royal Hotel) is situated right in the centre of the old part of the Gdansk Region, by the river Motlawa. High standards, fantastic location and the charismatic confines of what was once a royal granary make for an unforgettable stay. Tasteful and comfortable rooms assure rest and relaxation, with 30 spacious singles and doubles to choose from. Inside you'll find satellite TV, telephones and internet access, to name a few perks. Both the restaurant, serving European cuisine, and the coffee shop come highly recommended - the perfect places for meetings and conversation. The view from the room was great! The walk from the hotel into the old town takes 15 minutes. Nice breakfast and easy parking is a plus. The Krolewski is a modern hotel in an historic setting.The hotel is spotless and well furnished, with friendly professional staff and offers good value for money. The staff were all very helpful and spoke excellent English. The breakfast buffet was very tasty and always well stocked. The hotel exceeded our expectations. Wonderful view of the river and all the activities. Excellent restaurant and service minded staff. Close to the conference venue and an ideal startpoint for exploring Gdansk. Of course all this has a price - but it was really well worth it ! Was here on business and this one did the job perfectly. Happy to recommend. Cannot praise this hotel enough. Stunning architecture, great staff, views from the room and, for the quality, pretty good price per night. Plus Gdansk is really beautiful. Impressive building in a lovely location. I felt very happy here, staff and services were very good. A bit of a walk to the town centre but what a wonderful place to walk around in. In a word"What a swell hotel",everything about it was up to expectations,the location,the rooms the food and the staff were so very helpful. One of the very best hotels I have ever stayed in. Great views and service, and the Old Town of Gdansk itself was a revelation. I had my preconceptions about grim shipyards and grey housing blocks, but in fact the central part of the old city is full of stunning buildings, great restaurants and fun nightclubs! Enjoy (but don't tell too many people)! The stay at the Krolewski Hotel really made me feel like royalty! Great service, beautiful room, and the location (and view) can't be beat! Add a widget for Hotel Krolewski to your website and get more reviews!